After he made the delivery, 25-year-old Josh Lewis collapsed in the ER. Let’s face it: Food delivery is often a thankless job. For every nice customer you get, at least three are varying degrees of jerk. At the end of the journey, some people stiff you on the tip. Others try to rip you off. And at the really extreme end, others carjack you and stab you when you’re delivering pizzas to a hospital. 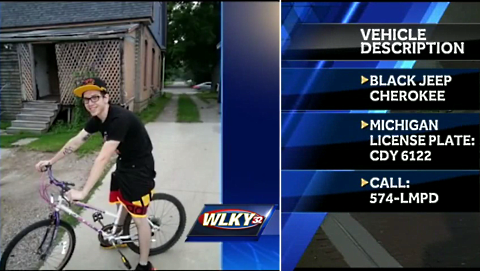 That’s what happened to 25-year-old Josh Lewis when he tried to deliver some pizza to Louisville, Kentucky’s Norton Hospital on Sunday afternoon. Lewis pulled up in his black Jeep Cherokee, then got stabbed in the back while he was getting the pizzas out of his car. Lewis was rushed to nearby University Hospital, where he was taken into surgery immediately for a collapsed lung. He’s currently recovering from his ordeal while police hunt for the man who stabbed him. The suspect, described as a 40-something man, was last seen taking off in Lewis’ Cherokee with the Michigan license plate CDY 6122. The black Cherokee has gold racing stripes and light blue trim. If you have any information, police ask that you call 502-574-LMPD. And we thought bicycle delivery guys had it rough. Stories like this make us want to tip our pizza delivery guys a little extra because it’s harder out there than we might always realize.